This entry was posted in Uncategorized and tagged KIA, telegram, Verne Richard Gray. Bookmark the permalink. 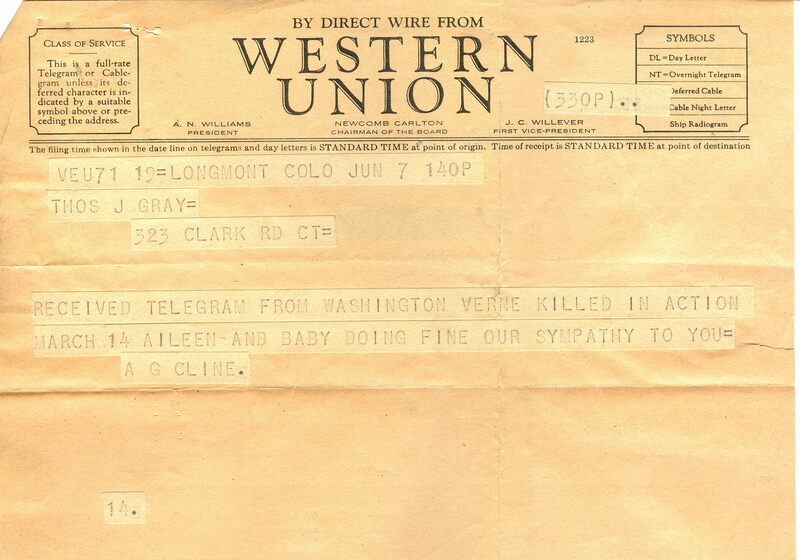 I find telegrams so cold and emotionless. An awful way to send / receive bad news. They were the email of the day. I find telegrams a cold way to communicate. An awful way to send / receive bad news. Having a USMC Captain and Sgt. come to me was bad enough, but learn of a death by telegram …..? I cannot imagine. According to her Wikipedia entry, the US Army changed its casualty notification system from sending telegrams to sending uniformed officers after pressure from Julia Moore, whose husband Hal commanded the 1st Battalion of the 7th Cavalry at Ia Drang Valley, the first major US ground action of the Vietnam War. The film showed Julia intercepting and personally delivering the telegrams round the married quarters at the unit’s base. According to Wiki, she actually accompanied the taxi drivers who were used to deliver the telegrams. An issue with using telegrams was that they caused unnecessary anguish when a telegram boy appeared with a telegram that contained good news, such as one from a relative informing his family that he was on leave and would be home soon. The telegrams were delivered to the street that a service man listed for his next of kin. The address was more often than not that of his mother or father; however, there were instances where the address could be that of the next of kin’s employer. Imagine being at work and having a telegram delivered to you that your son, husband or father was missing in action or, worse, killed in action. It would have been bad enough receiving it at home. In some towns the telegrams were delivered every so many hours, say at 9 o’clock, noon, 3 o’clock, etc. For some, there had to be a great deal of stress involved in wondering if the next delivery schedule would bring bad news. Finally, I would like to thank you for taking the time to research the method of next of kin notification and how and why it was changed. Those born after 1970 or so are rarely aware that there once was a time in the U.S. that when your loved one died in service you received a single piece of impersonal yellow or ivory paper saying they were killed in action. Thank you for this information. My heart goes out to those who had to see that Western Union man. I wonder how other countries handled the notifications sent next of kin. Will you be looking into it, Allen? It might make an interesting home front post for you. I think an article or post on how the major combatants of World War II notified a soldier’s the next of kin that he was missing in action, dead or wounded would be interesting. I can see such an article being published in a military history journal. I find it an interesting topic, but I don’t have the time to do it justice. The link below says that the UK telegram service was suspended in 1943, but perhaps this was for telegrams other than ones informing next of kin? I have just finished watching a Danish TV series called 1864, about the Prusso-Danish War of 1864. One of the character, a Danish soldier, took it upon himself to collect last letters from the corpses of his dead comrades and deliver them personally to their next of kin. There appeared to be no official method of notification of casualties to next of kin: either you relied on news from comrades, which was inaccurate in one case in the drama, or waited to see if your relatives returned. The telegraph then existed. There could, of course, have been some artistic licence. I have done a little research on the American Civil War. My sense is that deaths of soldiers were reported to their families by fellow soldiers. In those days, units were raised in specific cities or counties and the soldiers were serving generally with people they already knew. These were often neighbors, friends and relatives. It was natural then for the soldiers themselves to write home about what had happened to their comrades. I believe this had always been the way of war until we reached the 20th century with its mass, impersonal conscription. I really shouldn’t have brought it up, ol’ friend. Sometimes things just blurt out. Still difficult to read all these years later. I suppose there’s no real way to wrap it up in a telegram, but what dreadful news to get! Ohhh, no. Poor Aileen and baby. How do you fit in this story? Was Verne your uncle? I’m so sad. Bless you. I cannot “like” seeing this. Very sad and very somber. And very powerful. I did in the end click on like, but the people behind social media and blogs really should think about whether ‘appreciate’ or ‘thanks’ would be a more appropriate term. During my time at MoD London In the late 60s I used to transmit such telegrams, as far as I can remember the procedure was that they were delivered by the local police to next of kin. Not a nice job. Neither sending the telegrams nor delivering them would be a job that I would want. How did you come to be in such a position? Was an RAF airman working at the Ministry in those days. Part of the job was handling and transmitting these telegrams. Can’t have been a pleasant duty. It was a long time ago, and it was an experience shared by many families throughout the world. There was a comment about how other countries notified… In the case of Japan, their records were in pieces and/or scattered about. But similar to the US, there is a time after which an “MIA” is declared dead. In my uncle’s case (my dad’s youngest Seattle born-brother who was killed as a Japanese soldier), my grandmother received official word via a hand delivery to her Hiroshima home on or about October 15, 1947. Our family believes in hindsight my uncle was killed or died on Leyte in late 1944 . . . so three years.